It matters how you respond to Google reviews; it helps your local SEO, shows customers you are involved and care. Here’s what do with good, bad, and even annoying ‘man cold’ reviews. When it comes to the internet, however, it’s not just friends your customers are telling, and it’s not just the good experiences they’re talking about. The good, bad and ugly parts of your business are being broadcast to the world, and they’re often being read by prospective customers before they even make it to your site! One of the most popular platforms for this is Google Reviews. Customers can rate a business on a scale of one to five stars, as well as leave comments about their experience. A five star rating means you’re a rock star, a three star rating means your product or service was ‘meh’, and a one star rating means you have a very unhappy customer. But business owners can reply to these reviews, which gives them an opportunity to show the world how much they care about what their customers have to say—even the ones who aren’t happy. Google Reviews is part of Google My Business. If you don’t have a Google My Business account, you should get one. It’s free, and it helps your business appear in searches, either by showing your location on the map alongside competitors, or by profiling your business information at the right side of the screen. It is just as important how you respond to Google Reviews as it is that you respond. The reviews themselves are vital social proof to both Google and prospective customers alike that your business is worth engaging, plus it helps your SEO. The more reviews the better! Your responses also help with SEO, and they show your customers (and prospective customers) attractive characteristics about you and your business, mainly that you are listening to—and care about—them. This is easy; you just need to come up with different ways to say thank you, we’re glad we could help, etc. It shows everyone that you are reading all your reviews and paying attention to what your customers are saying. Reading a negative review—whether it has merit or not—can make us feel defensive and angry, and given how public a forum Google Reviews are, it may feel as though we are being treated unfairly. It’s best not to hit the reply button immediately. Instead, take a deep breath, look into the customer’s file if necessary, gather the facts, and reply in a prompt, professional and confident manner. These are one- or two-star ratings with no comments. These reviews are unreasonable, because you have no idea what you did wrong. Like a ‘Man Cold,’ where lots of attention is required because ‘everything hurts,’ these reviews offer you nothing specific to fix. Try as we might to please all our customers, sometimes people will have legitimate complaints. These customers may leave a one or two star rating and provide a description of their negative experience for all to see. Your Response: First, take a deep breath. Step away from your computer if you need to. Negative reviews happen, and it’s not the end of the world. Wait until you’re completely calm before you respond, and make sure your response isn’t angry or defensive, or it will only make matters worse. There are two sides to every dispute, and everyone who sees the bad review is waiting for your side of the story. Be factual and unemotional as you describe what happened from your perspective, and why you acted the way you did. If you were wrong, say so and apologize. If you were right, explain your position, but remember to keep your anger, frustration, or personal thoughts of the person in check. Condescending statements about what the person ‘should have done’ or how they ‘should have behaved’ will only make you look bad. The key to turning a bad review into something positive is sticking to the facts, describing what happened, and explaining why you acted the way you did. Most readers will appreciate that you took reasonable actions to address the customer’s complaint and having a professional manner about it can make you, and your business, look even better. 1–3 Star Rating: Respond to the review with facts, keeping emotions in check. Address the customer’s issues honestly, without revealing any personal information. 4–5 Star Rating: Thank the customer for taking the time to review. 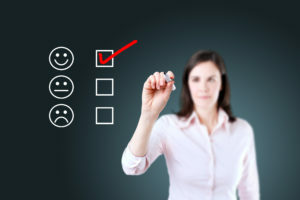 1–3 Star Rating Without Comments: Ask the customer if there was something specific they did not like about their experience with your business.